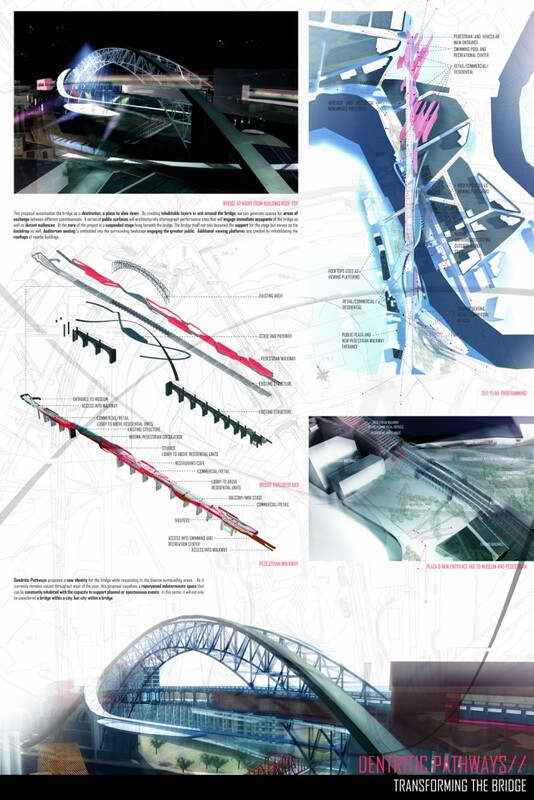 The word dendritic, in this project, is utilized for its association to a structure with branch-like extensions that is able to leverage a controlled but fluid movement within its network. We visualize the transformation of the bridge to have an effect that is visually, physically and conceptually similar to this in nature. 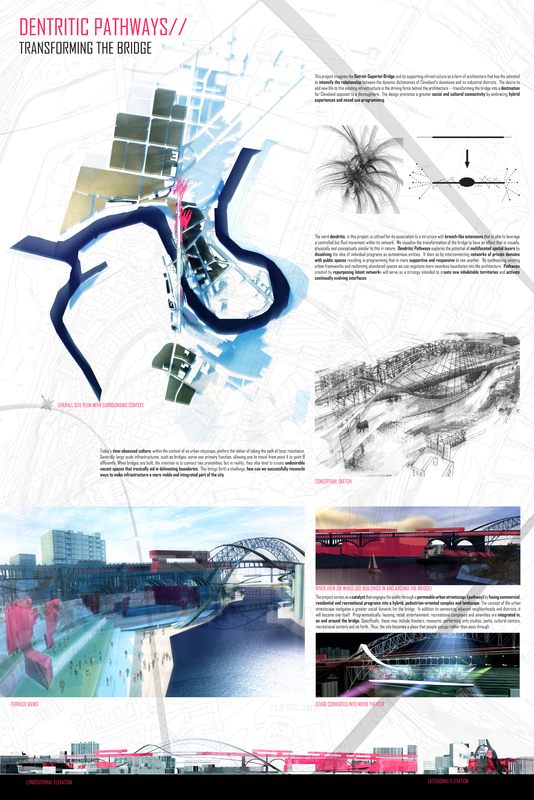 By creating inhabitable layers in and around the bridge, we can generate spaces for areas of exchange between different constituencies. At the core of the project is a suspended stage hung beneath the bridge. The bridge itself not only becomes the support for the stage but serves as the backdrop as well. Auditorium seating is embedded into the surrounding landscape engaging the greater public. Programmatically, housing, retail, entertainment, recreational complexes and amenities are integrated in, on and around the bridge. Specifically, these may include theaters, museums, performing arts studios, parks, recreational centers and so forth. Thus, the site becomes a place that people occupy rather than pass through. 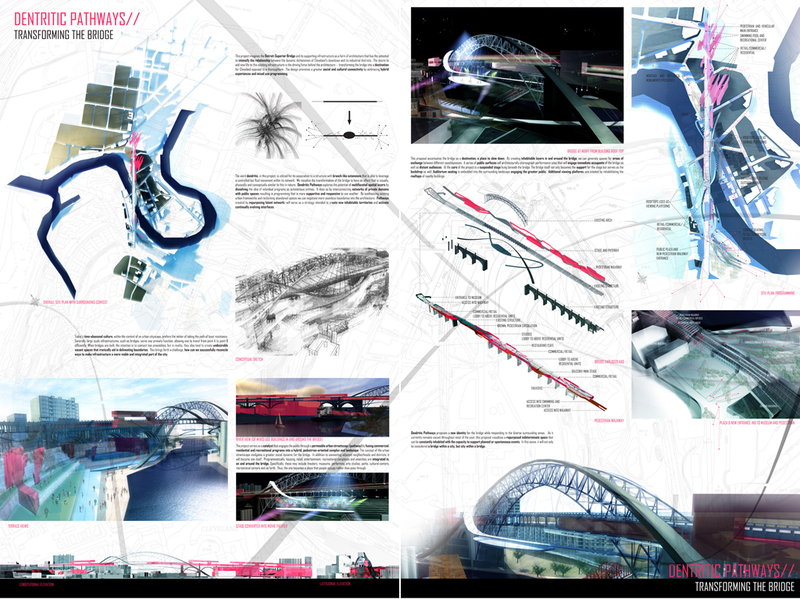 Dendritic Pathways proposes a new identity for the bridge while responding to the diverse surrounding areas. In this sense, it will not only be considered a bridge within a city, but city within a bridge.